Monica has now had quite a few visitors and although she is more awake and alert than ever, she still seems to favour visitor time for major sleeps hence very few people ever seem to get to see her awake. 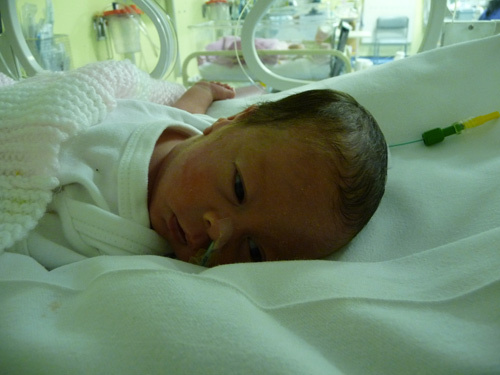 Her nan and grandad only heard her cry for the first time two days ago (yet she is nearly 2 and a 1/2 months old now!!). She is such a happy little baby and smiles a lot and has some wonderful expressions. Monica having her temperature taken after her Jabs. After Marie being on complete bed rest for 13 weeks and then our precious little baby girl spending the first 8 weeks of her life in hospital (initially graduating from the high dependancy unit at the Queen Charlotte and Chelsea hospital to low dependancy, the Isolation ward and then finally special care baby unit at the Lister hospital), to say that we are absolutely over the moon to have been able to finally bring our little girl home would be quite some understatement. Monica took the cold weather in her stride and slept the whole way home, although to be fair she did have a full tummy for the journey. Monica getting read to leave the hospital in her "snow" suit. 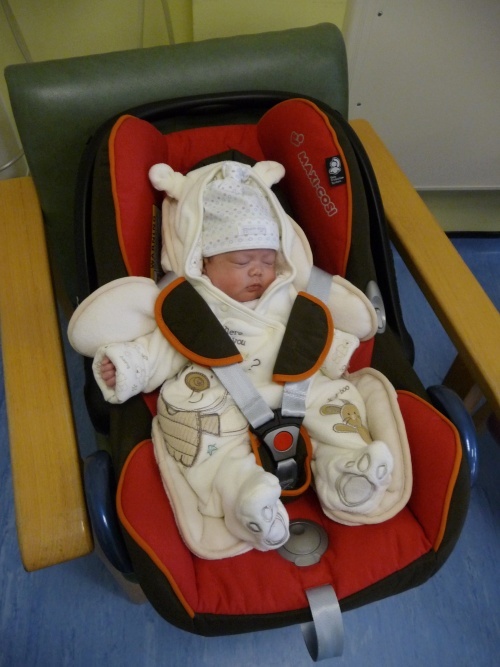 Monica in her car seat ready to go home. 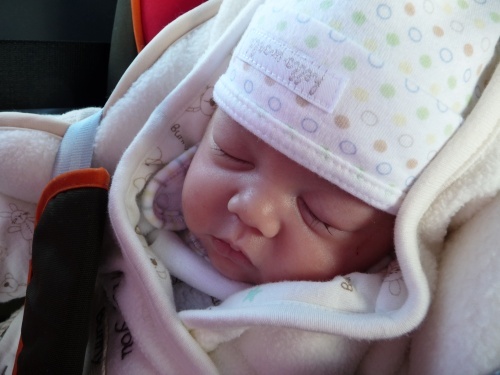 Our little baby girl asleep in the car. 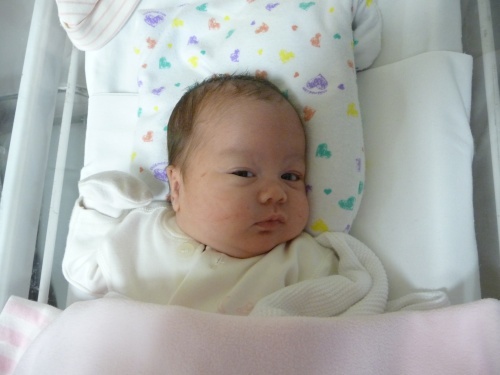 Update: 21st Feb 2009 - First Week At Home. 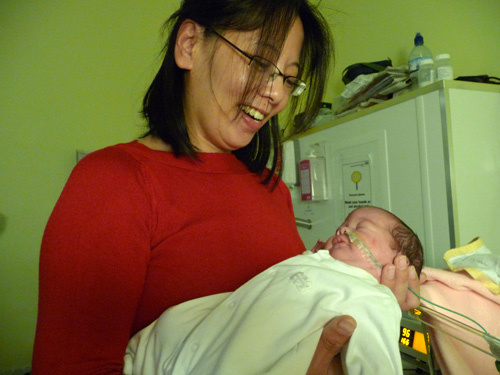 The first week at home has flown by and Monica is doing amazingly. It's incredible how strong she is getting, just a couple of weeks ago she couldn't even turn her head and now she moves her head from side to side all the time. The poor little thing had to go for another ROP Eye test yesterday which was incredibly unpleasant for her (not to mention for Marie and I). 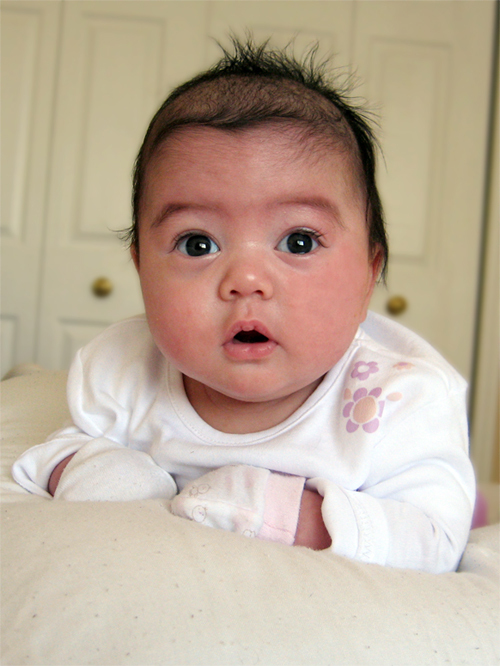 Retinas in babies aren't fully developed until week 36 hence the test to ensure that they have developed without issue. I had to hold Monica down while the doctor did what I can only describe as some very heartbreaking things to her eyes. Luckily she passed with flying colours and so has now been fully discharged and never has to have that test repeated again. Monica just before the NG tube was removed. Monica the night before she is due to come home. Continue to "Monica is Home"
We can't believe how fast the time is flying and how quickly Monica is progressing, but we are still cautious in getting to each and every milestone. One of the doctors actually said "why is this one still here?" to the other staff when referring to Monica which is cautiously encouraging. 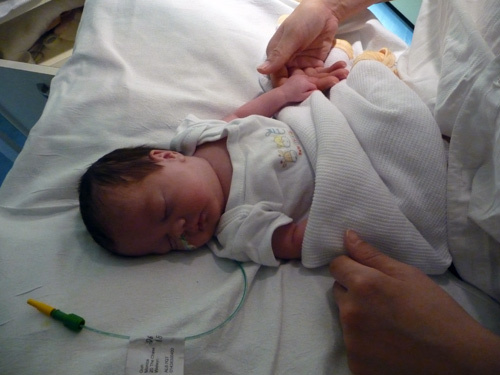 The nurses pointed out that Monica was still being tube fed until "normal" feeding had been properly established. We'll very soon be graduating from the Pampers Micro nappies to the next size up!! One of the first reactions of the doctors to Monica's desaturations was to recommend more blood tests but Marie managed to stall them on that and requested that they wait until tomorrow to see if Monica improves overnight. Unfortunately though, Monica is now back on Oxygen with tubes running to her nose. Mum said she exhibited quite a level of annoyance at this and promptly tried to rip both the oxygen and feeding tubes off and very nearly succeeded. She had to have a pair of mittens on for her own sake although I'm not sure she understands where her beautiful hands have gone as she did look a little puzzled at times. On the plus side though, today's events didn't seem to put her off her milk too much :-) (although it did take a lot longer to feed her than normal). Monica is starting to look more and more like a full term baby, albeit a bit smaller all round. Monica sunbathing blissfully oblivious to the snow and chaos outside. 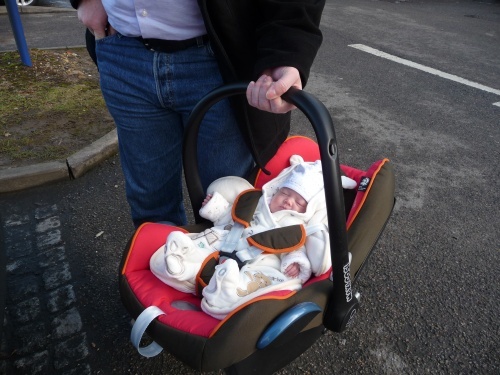 We had to stay in a hotel nearby the hospital to ensure the little ones milk supply route was kept open. Monica after her ROP Eye test (at 35 weeks gestation) and laying on her special "head shaping" pillow. We're not quite sure why they ruffled her hair up. Continue to "Monica is coming home"
Monica has been doing exceptionally well this week. She now weighs 2.420 Kg (5 lbs 5oz !!!!) which isn't far away from being double her birth weight. Some of the nurses even joke about her having a double chin and one of them that hadn't seen her since she was admitted from the Queen Charlotte's came over and said "Wow, Monica, you are a little fatty". We know that we are really lucky that Monica is able to tolerate her feeding regime although we are constantly amazed at how the doctors keep putting her 3 hourly quantity up (currently 54ml) every time her weight increases and how she takes it in her stride. I made the mistake of letting the milk run out half way through a feed and was chastised with a cry that I knew could only mean "do not even think about stopping my food". 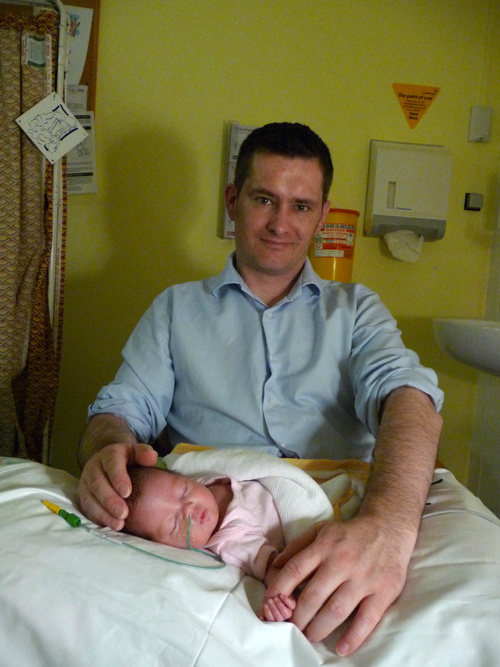 Sure enough no sooner had the milk-into-tummy syphoning resumed than the look of contentment and calm returned. Monica relaxing after her milk. Monica is continuing to do really well... especially in the eating department. She how weighs in at a huge 2.065Kg (4 lbs 8 oz)!! 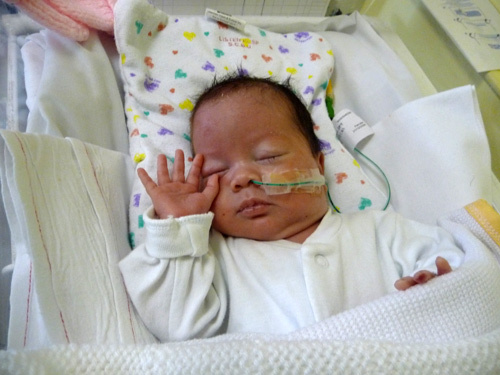 She has overtaken many of the other little ones in the Special Care Baby Unit (SCBU), and once she is able to feed without the tube we think they will start talking about letting her come home. Although Monica now feels quite big to Marie and I (and certainly a lot less fragile), her photos do still make her look much bigger than she is in real life. 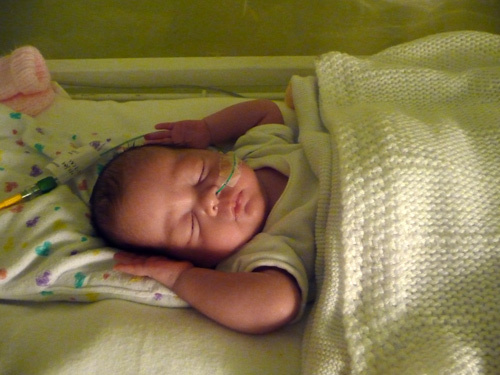 After Monica was moved to a cot she got a bit of a cold so had the sniffles for a few days. As a result she was desaturating and having quite a few bradycardic episodes. 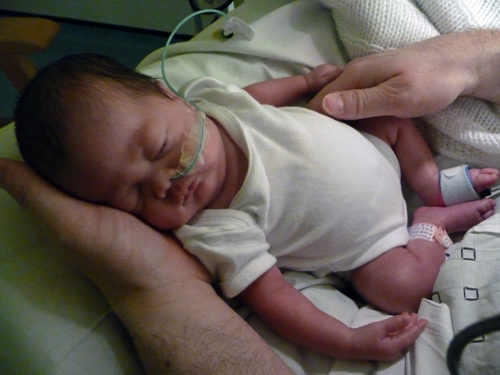 She had to have an oxygen tube connected and go onto a very small amount of oxygen on and off for 24 hours. A couple of days later though and it is clear she is feeling much better.... she is certainly much more alert and is completely off the oxygen (apart from the odd episode during feeding). 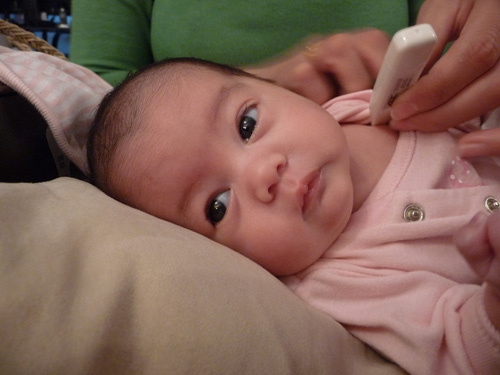 She is opening her eyes much more frequently and smiling a lot more. She is back to just the NG (Nasogastric) Tube for feeding, which is just as well as she has now learnt to move her head from side to side (after a lot of huffing and puffing and psyching herself up for it it would seem) so she'll get a lot less upset when doing so. 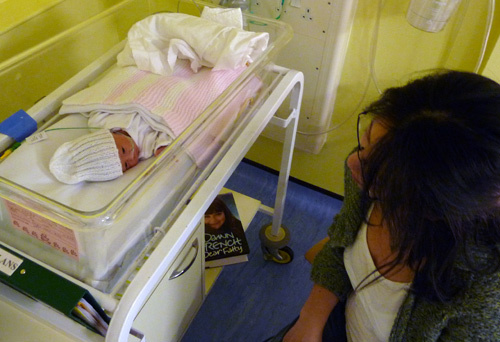 She has also learnt to grab and hold a finger when it is waved in front of her, which I'm mightily impressed with (given that she shouldn't even be born yet let alone opening her eyes and having decent coordination)!! I'd have to say she has also developed a great sense of humour, especially during nappy changes, but only when her dad is doing the honours! 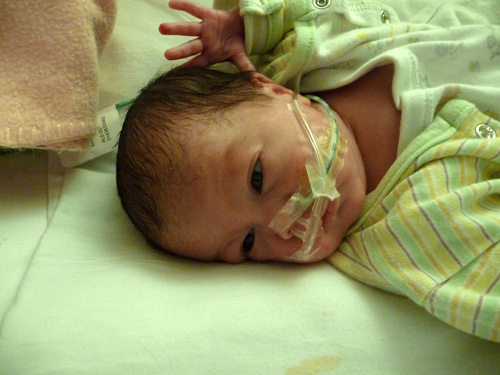 Monica had the oxygen tubes attached for around 24 hours. She didn't much care for them and so tried to remove them a number of times (and very nearly succeeded). 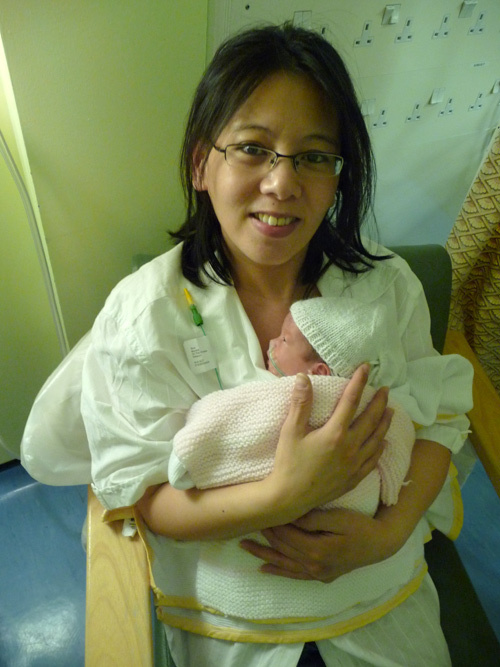 Monica on Day 35 with her delighted mummy. Monica cuddling mum on Day 36. 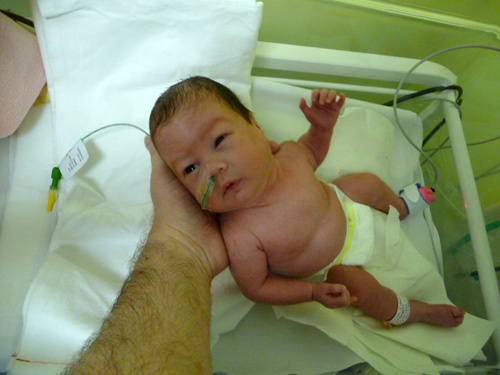 Monica has been weighed again and now weights 2.22Kg which is 4 lbs and 14 oz !! 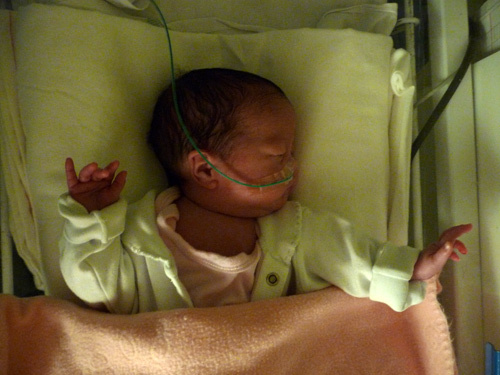 Monica just loves showing her hands off and gets really stressed when the nurses try to put her hands under the blankets. 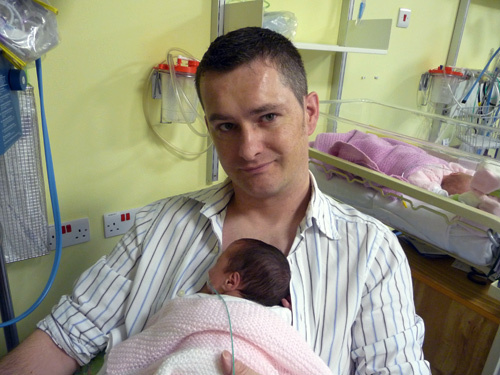 A very proud dad with a sleeping Monica (after having another 50ml of milk). 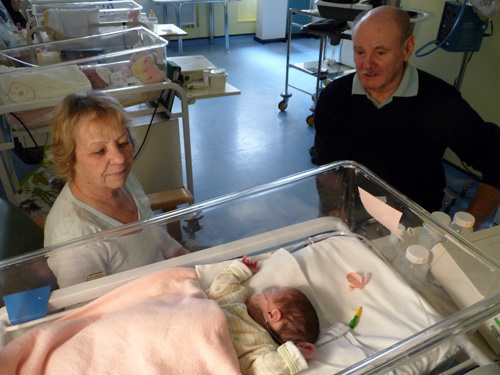 Auntie Linda and Uncle Lee visited but Lee declined to assist in a nappy change. Monica was on very good behaviour for Nan and Grandads visit. Monica is doing well after her blood transfusion. 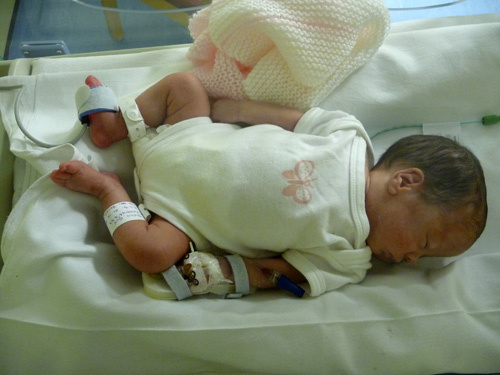 She has only had one desaturation since and has been moved out of the incubator and into a cot. 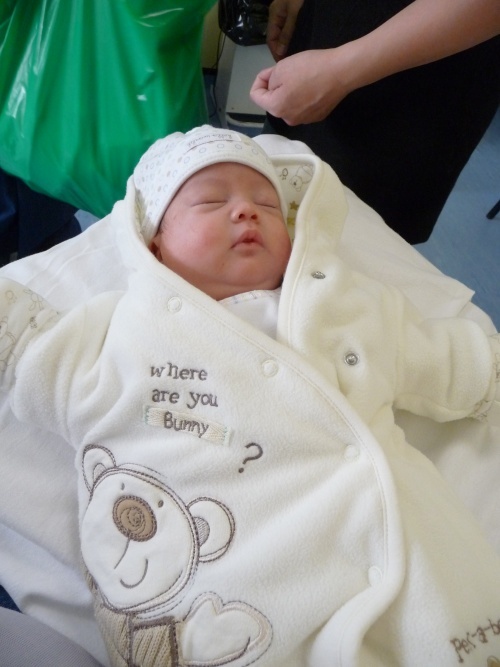 The Diuretics to counter too much fluid from the blood transfusion certainly made for interesting nappy change times!! Monica's new home and a smashing hat. Monica and mum having some cuddle time. She loves looking up and listening to her mummy. Monica with the hiccups still. Monica putting her fists up at daddy. She must be sick of the camera already. Today is blood transfusion day and we had a chance to quiz the doctors about the reasons behind this. I asked the doctor, "So, do babies need blood transfusions because you take all of their blood for all of the tests that you do". I was a little surprised when she answered "Yes", but appreciated the honesty nevertheless. 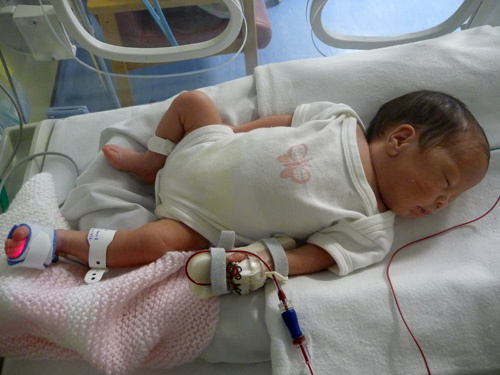 The blood transfusion went fine and we have noticed that Monica now has a lot more colour than beforehand. Ironically it seems that the way that they will test to see if her hemoglobin levels are now back to where they need to be will be to... yep.. take more blood. Mummy having a cuddle while Monica has her morning brunch (by tube still). Monica having her blood transfusion. Monica after her blood transfusion. It's difficult to see on camera but she is much redder than beforehand. Monica relaxed and having a look around after her blood transfusion. 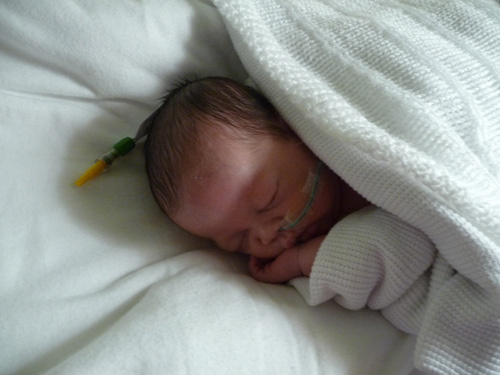 I guess that it is only now that we're in a room with lots of other prem babies we can appreciate how unusual it is for a baby born at 28 weeks to have a full head of hair. It's just normal to us, but looking around most of the other babies (even at 34+ weeks) don't have much hair.